Update 3-10-11. The Wired article has blown this page up a bit. There are some other seperate cars being seized now, different than Kaizo. Motorex cars are still here, still ok. Daryl from Kaizo's sentencing just went though this week. A small fine, community service, and probation. 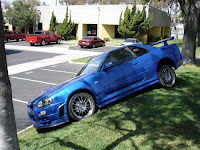 This is the reason the Nissan Skyline GT-R is illegal in the US. So is the seizure of vehicles only isolated to Kaizo cars in the state of California? Or is this going to spread nationwide? Also, what if a person were to put a VQ35 under the hood of a GTT, (kinda like putting the buggy engine in the GTT... not originally meant to have it), would that be considered legal? These people are just stupid for not taken care of their "proper paperwork" and the import process. 95% of skylines imported are undetected. I'm just like to say I'm so glad our government is wasting my tax dollars on something so retarded. lol they didnt take this car yet, and its got cali plates and fed legal too! Nationwide search and seizure, its all over the US, from what Ive read its a slow process but they are looking! So bottom line if its JDM and an abnormal vin "non 17 character" or "US DOT compliant vin" they will check into it! As far as putting a "compliant engine into a non compliant car body/unibody, I'd start with checking with epa, they call it "fast engine switching or something". Here is a kicker, if you take your cats off your mustang, or ls1 swap a 240sx then its not "federal legal" lol so go figure! Correct me if I'm wrong, but didn't nissan certify the z-tune to be available in north america? They were the only skylines that were allowed in directly from nismo. Nissan never certified the Z-Tune for the US. Only 20 cars were produced. It was rather interesting for me to read that article. Thanks for it. I like such topics and everything connected to them. I definitely want to read a bit more on that blog soon. also wht does (DOT) mean?? Seized means the police take it away from you. Normally they seize things because they are not allowed or illegal. DOT is Department of Transportation. It would cost about $500,000 to try and do it legally. Is this why the JustDriven blog mysteriously disappeared? Nothing has changed. A few minor things behind the scenes. Let me get this straight... these guys broke the law and sold vehicles illegally, and now the cars are being seized by the Feds... and you're appalled and outraged by this? I fail to see the problem. If you don't want your vehicle seized, don't buy illegally-titled vehicles. Pretty simple. I think the Feds made it abundantly clear after the fiasco with MotoRex what is legal and what is illegal when it comes to the Skyline GT-R (and basically every other vehicle that was not released in the United States). I feel bad for the owners, but at the same time, I don't--they should have known what they were getting themselves into before handing over all that money to Kaizo. The only thing that was abundantly clear after the Motorex ordeal was that the government entities involved can change their minds about anything whenever they want. Do your research. Guidelines for legalizing R34's was dictated to Motorex then 2 years later they changed their minds. That's why the Motorex R34's are grandfathered. As for the Kaizo endeavor, the only thing done incorrectly from a legal standpoint is that Kaizo never set themselves up to be recognized as a manufacturer by our federal government. So, unless some of the 30 states that have recognized them as such change policy to mirror federal standards, those states will allow ownership of said vehicles as long as EPA and DOT requirements for titling and registration are met. As previously stated, there are NO charged filed against either Kaizo or the individual owners. In cases where the skylines are resored to original specs, the seizures are justified, according to current laws. Any and all other seizures of the Kaizo vehicles (whether incomplete or alternately powered) is technically an unlawful seizure. That's why they're leaving cars with no drivelines alone. As long as the cars are registered as specially constructed or "kit" cars, they only have to be DOT compliant (lights, glass, safety equip.,etc.) and EPA compliant and carry at least 65% of non-oem equipment. So, in summation, it's perfectly legal to have a Kaizo bodied vehicle that is DOT and EPA complaint and is not a Nissan recreation but instead YOUR interpretation of what the car could have been. The R33 was the only skyline approved by the Fed before Motorex was shut down. It was the only skyline that completed all the necessary crash tests before that time, so its the only skyline that can be legally imported into the US, that is after a bunch of stupid mods are done. It is possible to make a GTR into a kit car, but you couldn't have an RB under the hood or the skyline transmission. You could get close, as the 300ZX Turbo had the same transmission as the R32, but you would need to drop in a V8 or something to be legit. 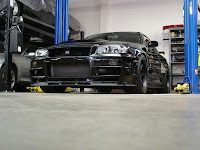 <> I know its not a true GTR but it would be free from seizure. If you like this kind of eco-nut totalitarianism keep voting for democrats. If you like this kind of eco-nut totalitarianism keep voting democrat. Well this is a story you will begin to see more and more with that communist government that you guys have over there. The next thing you will probably see is people disappearing when they disagree with the government authorities. All we have to do is wait 25 years and these cars will be considered "classic" and we can import them all we want. 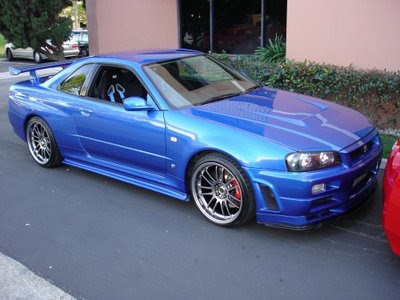 So we only have to wait until 2023 to import the first "classic" R34. You can thank Mercedes for all this non-sense.